Courtesy of Bruce Wigo, International Swimming Hall of Fame, Florida. When an open water swim takes on the additional pressure of being a life-and-death situation, especially with the lives of others at stake, the term epic could not be more true. 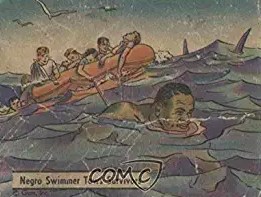 Bruce Wigo of the International Swimming Hall of Fame researched the long-forgotten story of the exploits of Charles Jackson French, a 23-year-old cook in the United States Navy in the Pacific theater during World War II. Guadalcanal in the Solomon Islands. A raft was packed with wounded men. French heroically volunteered to swim the raft away from shore by tying a rope around his waist and pulling his fellow sailors away from shore as night fell. After a long eight hours, the raft was eventually spotted and the men were saved. For more information, read Wigo's detailed account of French's remarkable career here. For a World War II trading card that commemorates French's exploit, visit here.